Lauren Cohan Says Meaning Behind 'Whiskey Cavalier' Title Is 'A Secret'! Lauren Cohan stopped by Jimmy Kimmel Live on Thursday (February 28) and dished all about her brand new series Whiskey Cavalier. The 37-year-old actress stars in the new ABC series opposite Scott Foley, 46, who plays the title role, FBI agent Will Chase. Scott‘s character gets a new assignment after a tough break-up with CIA operative Francesca ‘Frankie’ Townridge, played by Lauren, with the codename Fiery Tribune. “Fiery Tribune, I think they thought just in case these spy’s are ever on television we should give them slightly flourished spy names,” Lauren added about her name – Watch the interview below! Mark Wahlberg, Lauren Cohan, and Ronda Rousey team up to premiere their new movie Mile 22 at Westwood Village Theatre on Thursday (August 9) in Westwood, Calif. They were joined by their castmates Sam Medina, Peter Berg, CL, Iko Uwais, Carlo Alban, and Nikolai Nikolaeff. Ski racer Lindsey Vonn and her boyfriend, Nashville Predators NHL star P.K. Subban, also stepped out to show their support. Guests enjoyed Casamigos cocktails at the after-party. FYI: Lauren is wearing a Schiaparelli Haute Couture dress, Christian Louboutin shoes, a Tyler Ellis clutch, and Neil Lane jewelry. Ronda is wearing a House of CB jumpsuit, Tamara Mellon heels, Dena Kemp jewelry, and an Inge Christopher clutch. Mark Wahlberg is all smiles as he hits the red carpet at a photo call for his new movie 22 Mile on Saturday (July 28) at the Four Seasons Hotel in Los Angeles. The 47-year-old actor kept things in blue sweater and jeans as he was joined at the even by his co-star Ronda Rousey, Iko Uwais, Carlo Alban, and Lauren Cohan. In the movie, Mark stars as James Silva, an operative of the CIA’s most highly-prized and least-understood unit. Aided by a top-secret tactical command team, Silva must retrieve and transport an asset who holds life-threatening information to Mile 22 for extraction before the enemy closes in. Mile 22 opens in theaters nationwide on August 17 – and you can watch the trailer here! FYI: Lauren is wearing an Altuzarra dress, Jimmy Choo heels, and Alexis Bittar earrings. Lauren Cohan is opening up about her contract negotiation on The Walking Dead. The 36-year-old actress made an appearance on Andy Cohen Live on the SiriusXM channel Radio Andy on Wednesday (July 25). “In a time of parity in our industry and in my show….it wasn’t actually that I was asking for more, it was that my contract finished,” she said. FYI: Lauren is wearing a Stella McCartney top and pants with Olgana heels. 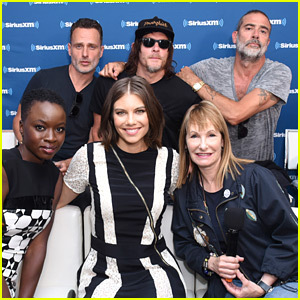 The Walking Dead‘s Andrew Lincoln, Norman Reedus, Jeffrey Dean Morgan, Danai Gurira, Lauren Cohan and producer Gale Ann Hurd speak on SiriusXM’s Entertainment Weekly Radio Broadcasts at 2018 Comic-Con this weekend in San Diego, Calif.
During Comic-Con, Andrew confirmed he would be leaving The Walking Dead after the upcoming season. “He’s our quarterback,” Norman added. FYI: Lauren is wearing APM Monaco Meteorites jewelry. Andrew Lincoln Confirms 'Walking Dead' Exit at His Final Comic-Con for the Show! 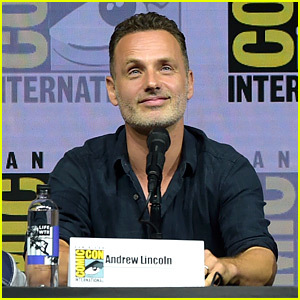 Andrew Lincoln appears on stage for the Walking Dead panel during day two of 2018 Comic-Con on Friday (July 20) in San Diego, Calif. The 44-year-old actor, who was joined by co-stars Norman Reedus, Danai Gurira, Lauren Cohan, and Jeffrey Dean Morgan, confirmed his exit from the series after the upcoming season nine. Watch the official Comic-Con trailer below!